do like anakin and padme better than han solo and leia? Whos your favirte couplr of none couple in ster wars? what do u think of Anakin and Padme as a couple? 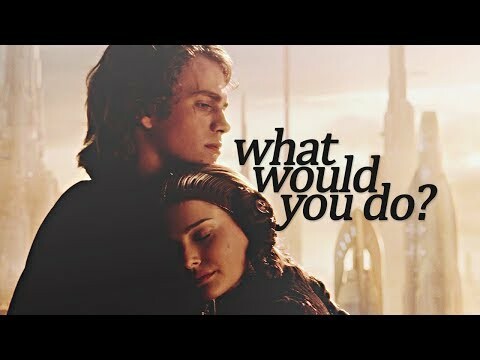 would u have pushed padme away and married anilin????? Will u kom bij BEN SKYWALKERS spot? Will u kom bij MARA JADE SKYWALKERS spot?? Do u think this is true? P: I brought u something. Are u hungry? Life seems so much simpler when you’re fixing things. I’m good at fixing things. Always was. Why’d she have to die? Why couldn’t I save her? I know I could have! P: Sometimes there are things no one can fix. u are not all-powerful, Ani. P: Stay with the ship, R2. C: The maker! Master Ani! I knew u would return. I knew it! And Miss Padmé. Oh, my. C: Bless my circuits! I’m so pleased to see u both. A: I’ve come to see my mother. P: I don’t want to disturb you. A: You’re presence is soothing. P: u had another nightmare last night. A: Jedi don’t have nightmares. A: I saw my mother. I saw her as clearly as I see u know. we went into aggressive negotiations. P: “Aggressive negotiations”? What’s that? A: Well, negotiations with a lightsabre. A: Sure u do. u just don’t want to tell me. P: Are u going to use one of your Jedi mind tricks on me? A: They only work on the weak-minded. P: All right. I was 12. His name was Palo. We were both in the Legislative Youth Program. He was a few years older than I. Very cute. Dark, curly hair. Dreamy eyes. P: We used to come here for school retreat. We would swim to that island every day. and try to guess the names of the bird singing. A: I don’t like sand. Padmé walked back into her apartment she had been sitting outside on her private veranda for the past hour, reflecting on all the events that had unfolded in the last few days. She knew that her future with Anakin was going to be difficult but she had faith that their strong love would get them through anything. As she was getting nearer to the sitting room she took off her black kant, lace sjaal that she had draped around her shoulders and folded it in her arms. Padmé was extremely grateful that she and her husband were finally together again. They had been apart for five long months because of Anakin's involvement in the Outer Rim Sieges. She was also extremely relived about how he had taken the news that she was pregnant. For Padmé had been terrified waiting in the shadows of the Senate Office Building's giant pillar columns wondering how he would take this shocking, unprepared news. Luckily for her Anakin had not only understood he had been ecstatic. The Anakin Skywalker Fangirl fan Club spot needs members and content. kom bij us, girls! a comment was made to the pop quiz question: When did Anakin die? a poll was toegevoegd: Who is the most beautiful? a comment was made to the poll: My 15 favoriete Anakin & Padmé scenes. (All films + CW serie) Which one is yours? Is Padme older than Anakin? Do think they should make a 7th ster wars movie?